The longer I garden, the more I appreciate perennial vegetables. Plant them once, take care of them by weeding, watering and feeding the soil around them with good compost, and they’ll return reliably year after year. Many of these perennials are among the first edibles of spring, which seems to make them taste even more delicious to winter-weary taste buds. 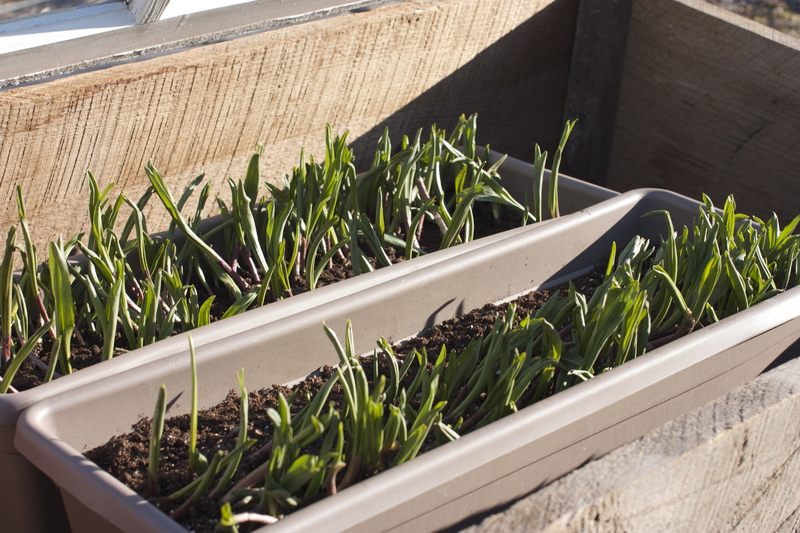 Some perennial spring vegetables don’t even require planting. Dandelion greens, chicory, sorrel, and, later in spring, lambs quarters and nettles, are all wild plants that are abundant self-seeders (aka, weeds). All of them are best picked young and tender, before they’ve flowered (with nettles, be sure to wear gloves, to avoid the stinging hairs that are destroyed in cooking). Many of these “weeds” are so delicious that vegetable breeders have come up with more refined versions sold through seed catalogues. 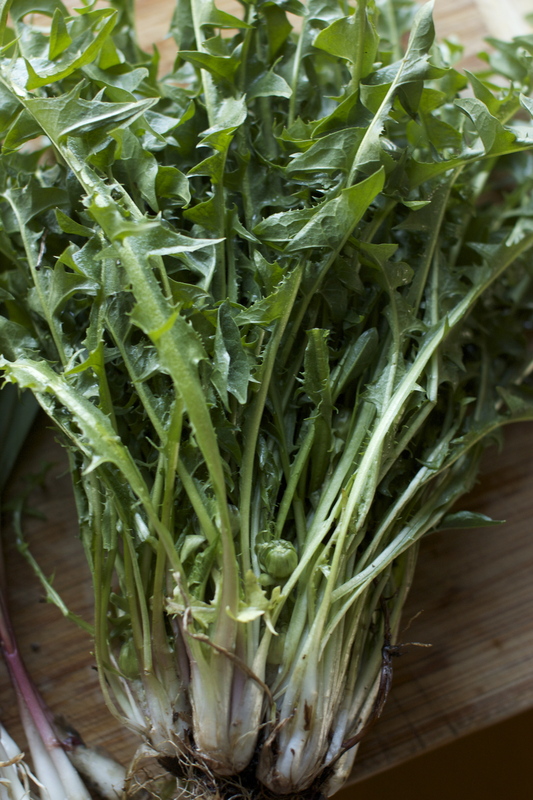 Two of my favorites are super-cold hardy Italian Red Dandelion (it’s actually chicory) and Good King Henry, a member of the weedy Goose Foot family that tastes like spinach and can be harvested from early spring into fall. 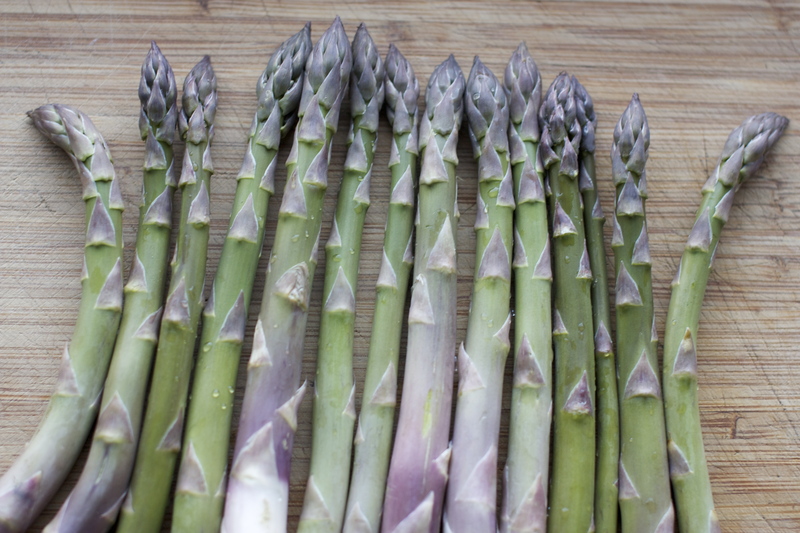 Asparagus, unlike perennial weeds, takes a bit of work. It likes lots of good compost and requires watering all summer, or it won’t be productive year after year. Too, you have to keep grass from growing in amongst the shoots, and war with the dreaded asparagus beetle, which can wreak havoc. One method of achieving both weed and bug suppression is to interplant asparagus with parsley and dill, which can out-compete grass and which asparagus beetles hate. The herbs are also a good use of space, providing a season long crop even after the 4th of July, when good gardeners let their asparagus grow into full, tall ferns to gather energy for next season. 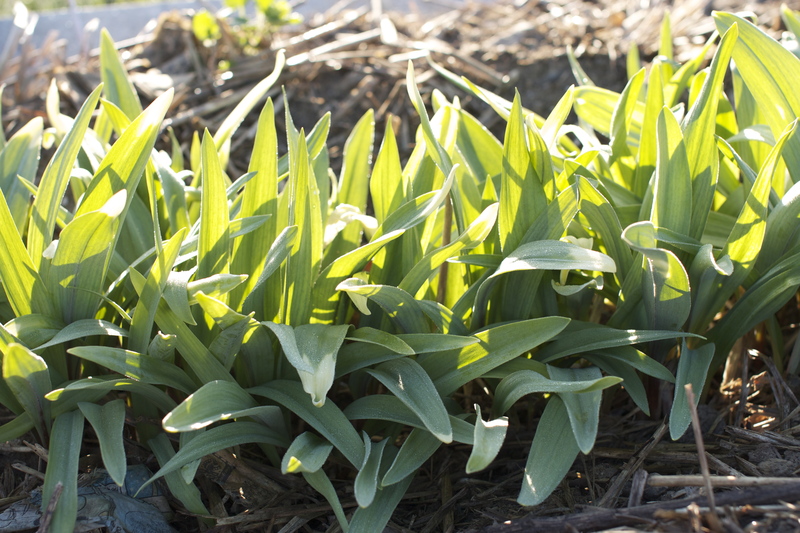 Ramps, if you’ve never encountered them, are a wild native woodland allium, related to both onions and garlic and tasting a bit like both. They’re happy at high, cool elevations, in the kind of moist mixed woodlands where trilliums and golden seal grows beneath maples and beeches, and can completely carpet the early spring forest floor. It seemed likely that ramps would grow around here, but though I scoured our woodlot every spring, I could never find wild ramps growing in it. 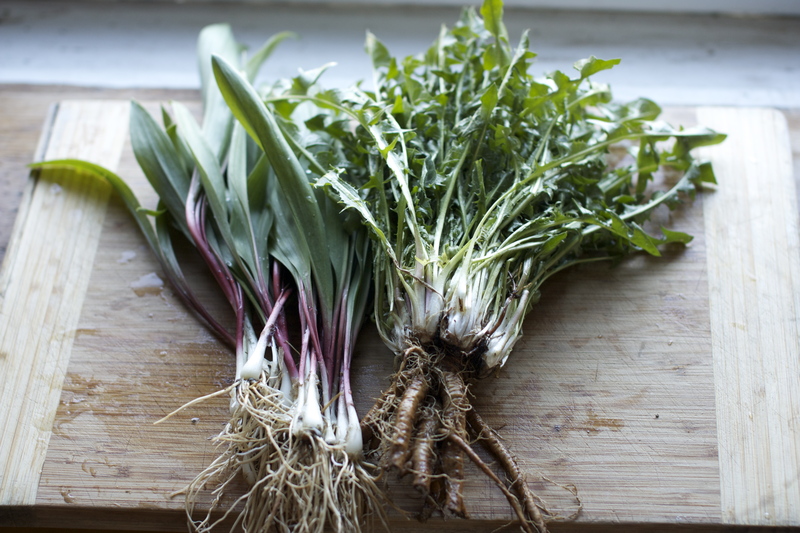 Finally, a few years ago, I took matters into my own hands and ordered a shipment of mature ramps from Ramp Farm Specialties in West Virginia. Owner Glen Facemire only ships his bulbs in February and March (seeds are available all the time), so when he heard that New Hampshire had a big snow storm brewing just as he was putting my ramps in the mail, he gave me a call to talk me through how to care for his “babies” until I could put them in the ground (it turned out that a couple of window boxes in a cold frame did the trick). $194.00 (shipping is free). I’d suggest splitting an order with friends and scouting likely locations this summer (you’ll want to try several spots to be on the safe side). Do order early, so you don’t miss out, and be prepared with window boxes and a cold frame, just in case. Early spring vegetables fresh from the garden don’t need much in the way of preparation. All of them are delicious cooked fast and hot with olive oil or with chopped bacon. They’re also perfect stir fried along with fresh spring chives, a bit of ginger and a little soy sauce combined with water or orange juice. Ramps and asparagus can be lightly tossed in oil, sprinkled with salt and pepper, placed in a grill basket and cooked briefly on the grill. 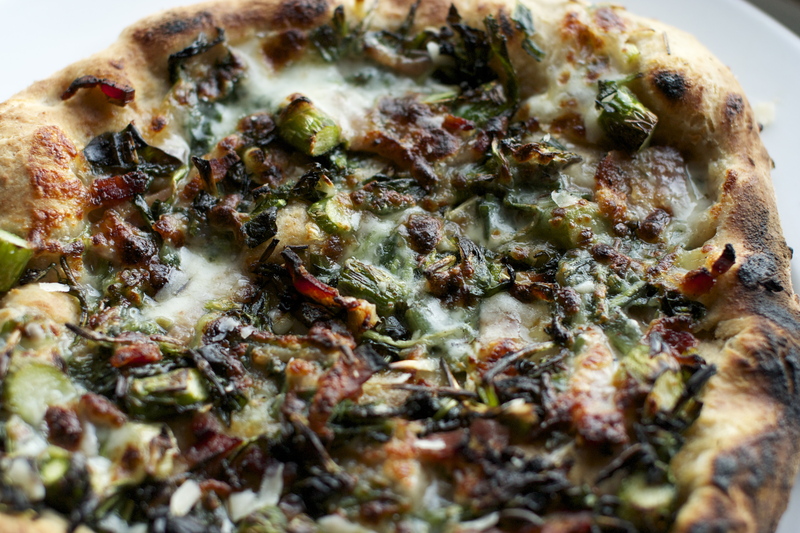 Below you’ll find a recipe that combines dandelion greens, ramps, and asparagus cooked with bacon as the topping for pizza. Though the pizza dough needs a full day to rise (or overnight in the refrigerator), once it’s ready, the recipe goes together in a snap. Feel free to substitute store-bought dough if you’re short on time. Too, feel free to leave out the bacon if you’re a vegetarian, and to substitute in whatever fresh spring vegetables you have on hand. Spinach or escarole would be delicious. And if you’re only feeding two people, divide the topping recipe in half. Store the extra pizza dough in the refrigerator in an oiled plastic bag and use it later in the week. It will be good for several days. For the dough, combine all the dry ingredients in a large bowl. Add the water (you will need the larger amount if using whole wheat flour) and stir well with a spoon until well combined – do not knead. If the mixture seems too dry (it should be quite sticky), add a little more water to incorporate all the flour. Cover with plastic and set on a cool counter to rise. If it is very warm or you’d like to use the dough more than 18 hours later, place in the refrigerator. Allow the dough to rise until doubled – if it’s warm this will happen in about 12 hours, if it’s very cool, in about 18 hours. When ready to make the pizza, preheat the oven to 450-500 degrees (my oven doesn’t go to 500 – use the higher heat if you can). If you have a pizza stone, place it on the top rack. Divide the dough into 4 balls. Lightly oil them with olive oil, cover them with plastic and set aside on the counter to rise and soften while make the topping. Heat a large skillet and add the bacon if using (otherwise, heat a tablespoon of olive oil in the pan and continue with the greens, below). Cook the bacon until it is beginning to brown. Remove the bacon from the pan, pour off most of the fat, and return the skillet to the heat. Add the dandelion greens, ramps or garlic, asparagus and bacon pieces, if using. Cook, stirring, until the greens are wilted and tender. Season to taste with hot red pepper, black pepper and salt (you may not need any salt, depending on the bacon). Remove the greens from the pan and set aside. Turn the oven to broil to super-heat the pizza stone. If you don’t have a pizza stone, place a large aluminum sheet tray in the oven to heat (do not use a tray that has a non-stick coating as it will burn). Stretch the dough either by rolling with a rolling pin (you’ll need to use flour to keep the dough from sticking) or with your hands to a very thin, approximately 12-inch rough circle. Place the round on a well floured pizza peel (if you have one), or onto the back of a well floured aluminum sheet tray. Cover the dough to within about 1 inch of the edge with ¼ of the greens and then ¼ of the mozzarella (leave spaces between the pieces of cheese). Drizzle the pizza with a little olive oil. Open the oven door and slide the pizza from the peel onto the pizza stone. If you are not using a pizza stone, carefully remove the hot sheet tray from the oven, sprinkle it with a little flour, then slide the pizza from the overturned sheet tray onto the hot sheet tray and return it to the oven. The pizza will cook very quickly – in about 2-4 minutes, depending on your oven. If the pizza begins to burn (a few black spots are desirable, but not an over-all char), turn the broiler off, but leave the oven temperature at 450-500 degrees. You may need to slide a spatula under the pizza and turn it, or turn the sheet tray, so that it cooks evenly. It is done when the edges are well browned, and black in spots. Remove from the oven, slide onto a cutting board, and cut up and serve immediately. Repeat with the other three pieces of dough. Serves 4 generously.